Want to see something that’s a little different during your visit to Arizona? We recommend a trip to Mystery Castle in Phoenix. This place is crazy!! It’s literally made of almost anything you can imagine. Plus, if you think of the most random item, it’s probably in there. So what exactly is Mystery Castle? Well, it’s a home made by Boyce Luther Gulley for his daughter Mary Lou. You see, Boyce was living in Seattle when he was diagnosed with tuberculosis. And how did he deal with the news? He left his wife and daughter and moved to Phoenix. But while he was there, he started building a castle for his little girl; his princess. This was in the 1930s. He used all kinds of materials, from mortar and goats milk to railroad tracks and telephone poles. In total, the castle has 18 rooms, 13 fireplaces, a chapel, a bar area, and a dungeon. Unfortunately, Boyce passed away in 1945, before he had sent for his family. They didn’t even know about the house until an attorney notified them that they had inherited the property. Soon after, Mary Lou and her mother moved in. To earn a living, Mary Lou (an adult by this point) starting giving tours of her castle. The castle became pretty well known and was even featured in Life Magazine. Mary Lou continued to give tours until she passed away in 2010. The property is now taken care of by The Mystery Castle Foundation, which also provides tours. The tours are about an hour long and very informative. During our visit we had two tour guides, one for the 1st floor and one for the 2nd floor. When a jumpy caretaker shot a bullet through the window, they did this instead of replacing the glass. Much of the furniture in this room is made of cactus wood, including the chair at the top right. The Jean Room: Where jeans hang from the walls and ceiling. And there’s a dog. 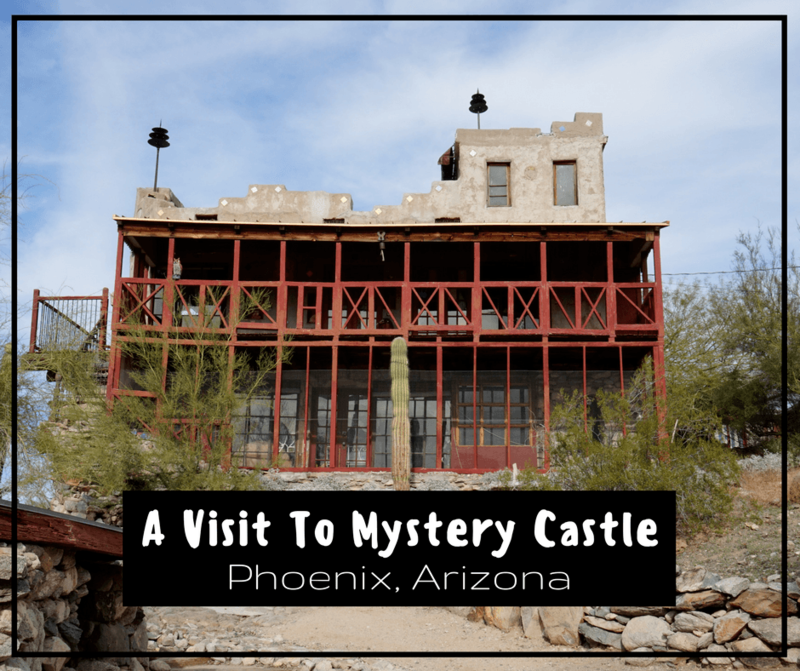 Like we said earlier, this attraction is definitely out of the norm, but that’s what makes Mystery Castle in Phoenix a must see. And it’s a castle. Who doesn’t like castles?? Who The Heck Is Buddy? Looks like a place my niece would love! Yay! How old is your niece? This is so cool! How have I never heard of this. This place is right up my alley. I’ve been to Phoenix a few times but had no idea this place existed. I’ll definitely try to visit if I get there at the right season again. Timing your visit will be important, don’t go in the middle of the summer! Looks quirky and cool – my kind of place! Crazy!! I lived in Phoenix for about a year and didn’t end up making it out to this place – have noted it on my list for when we head back for a return visit. Looks cool! Awesome! I think you’ll like it Meg! That place is awesome! I love quirky and could see a bunch of things i’d like in my own house! Thanks for sharing it! what a funky place! Looks like a cool place to visit! This is so cool! Totally off the path! I should add it to my list of things to see in Phoenix! Mary Lou must have been very old when she passed away. I wonder if she had made any notable changes to the castle over the years. Anyways one thing I don’t quite get is that why Boyce left his wife and daughter for 15 years because he obviously loves his daughter enough to have built the castle for her? I’m not really sure. Maybe he just didn’t want them to see him as his health deteriorated. Great story. I live in Phoenix, can’t believe I’ve never been here.